Flexible collaborative workspace with private options are available at this 9,000 sq. ft. business center in the Jacksonville / Beaches area. A business lounge seats up to 40 people while there are meeting rooms suitable for up to 16 people. The area's foremost regional transport links are also excellent and offer a wide range of convenient and frequent services throughout the surrounding area and its surrounding district. High end office suites with a variety of amenities and services. Conference rooms, beautiful lobby and virtual offices. Full time personnel at your convenience. Conveniently located near Downtown Jacksonville. The locality also offers a range of exceptional and highly convenient transport links, which make the center easily accessible from any part of the region and ideal for both occupying tenants and travelling commuters. State of the art business centre with many services to choose from. Bank conveniently located in building, around the clock security, café/game room and ready to use technology. Surrounded be beautifully manicured lawns. Easy access to major businesses, highways and lodging. This Class A building offers tenants with a multitude of premium amenities and services that include an on-site management team, IT support, meeting rooms, access to a trained receptionist and much more! Fully furnished office suites and coworking desks offer an exclusive experience for all to enjoy. This location provdes access to many of the area's best restaurants, local activities and shopping centers. Right next to Baptist Medical Center South and with shopping centers less than a mile away, this fully furnished and flexible office space is close to I-95, I-295 and Philips Highway while an outdoor gazebo seating area is ideal for a spot of lunch or casual meetings. This center's commercially significant location also features a number of convenient transport links, with road and rail connections operating frequent services throughout the district. Just a block from Jackson Landing this modern and professional office space provides private offices suitable for up to six people along with co-working opportunities. The exposed brick walls are sure to impress your clients. The locality provides a range of fantastic and convenient transport opportunities, with frequent services operating throughout the local area and this makes this location easily accessible from any part of the wider region. Located in the heart of Downtown Jacksonville this iconivc42-story Class A office tower provides a range of executive suites, meeting rooms and co-working space with impressive views over the city and great transport links via road and air. With public transport links just across the street and easy access to I-95, I-10 and I-295 and not far from Jacksonville International Airport it is fair to say this location has fantastic transport links. 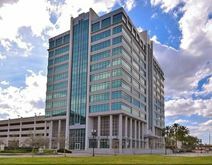 This prestigious and exceptionally equipped business center is set within an attractive landmark office building in the high end business district of Jacksonville. Featuring superior amenities and professional services including 24/7 security, conference rooms, a gorgeous lobby, state of the art equipment, and professional staff. Easy access to an array of different shops, restaurants and entertainment. Conveniently located with easy and convenient access to I-95, I-10, Highway 1 and the North Bank and providing stunning views of St. Johns River, this 28-storey corporate tower provides a highly prestigious and commercially renowned business address offering and extensive variety of Class A and extremely innovative office space solutions and flexible workspace provision for corporate clients of any industry or background. This center is located in the historically known neighborhood of Jacksonville and is voted in the country's top ten. With a unique mixture and design history culture, and charm this center is one of a kind. Stop in and visit the furnished private office suites. Meet with one of the team members to learn more about the amenities such as reception services, meeting rooms, furnished office suites and more. Business centre with state of the art technology, conference rooms, and fully furnished offices. Endless amenities with easy access to restaurants, shops and major hotel chains. Within seconds from I-95. This campus-style business center provides a relaxed atmosphere with an abundance of open space and stylish fountains sure to impress your clients and corporate guests as they arrive at this fantastic office setting and commercially focused venue. While only 15 minutes from downtown Jacksonville you will have everything you need on-site including a deli and a gym. The area's transport links are excellent and especially convenient for commuters to the site. This fully functional and exquisitely furnished contemporary business center installation is ideally suited to provide working professionals with an array of corporate services and state of the art technological facilities to meet your specific business needs and corporate requirements. Centrally located with easy access to major cities and highways, this building offers large offices with great distribution. This is a prime location, strategically placed within walking distance of the new Courthouse, Federal Building, shops, a range of fantastic local restaurants and highly convenient public transport links. Offering 14th floor office suites and exquisite workplace solution packages with great views of the immediate locality. All suites are fully furnished and a host of business services are available to clients.